On January 3rd 2008, I set myself a few goals for 2008. You can see full post here if interested. spin more, I ended up selling my spinning wheel and spinning fiber in September because I just didn’t have enough time to spin. become more proficient with my sewing machine and sew more, I bought myself a even nicer sewing machine in March and haven’t stopped sewing since. Which is probably why I didn’t have time to spin anymore. knit 20 pairs of socks, I ended up knitting 12 pairs of socks, plus an additional 5 single socks and 2 other started. finish at least 2 big projects (finish the Tree Jacket and the Comfort Shawl) and a few non-sock smaller projects, Tree Jacket was frogged and the Comfort Shawl is probably going to be frogged as well. I am working on one big project, Calvert and knit myself the Celtic Vest. I also knit a few smaller items. do more fair-isle and more lace, none of that happened. spread my time more evenly between knitting, sewing and spinning and still spend time doing other things like cooking, reading and exercising. I’m not sure about that. For 2009 I will revisit some of these goals. 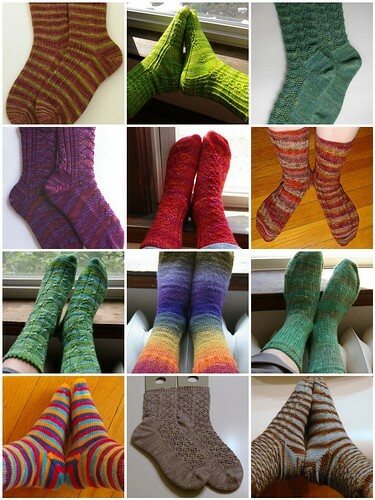 Try to finish one pair of socks a month, or maybe finish at least one sock per month. Finish Calvert (hopefully it fits well) and cast one for another sweater. I have a few sweater projects in mind, but that will be for another post. Knit myself a Clapotis. Yeah, I know, a Clapotis. 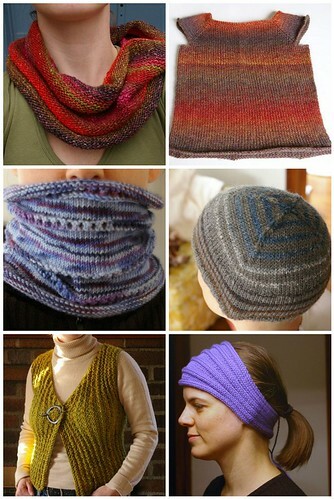 I’ve never knit one, yet, although I’ve had the yarn since the first year I started knitting. Knit one lace shawl, just one! Try out weaving. For that I have a good head-start. I am starting a weaving class once a week from January till the end of March. I’ll let you know how that goes! While I’m sorry you sold your wheel, there’s a freedom in acknowledging where your life is, and letting go of the things that don’t fit inside it anymore. Go you! Great goals. I admire that you evaluated your 2008 goals to see what you accomplished, which was a huge amount despite not achieving everything on your list. Your socks are beautiful. All of your projects are lovely! And at least you tried new projects, even if they ended up being frogged. Great goals! I bet the fair-isle mittens and socks will be gorgeous! You definitely got a lot done – especially when your sewing achievements are included!